I thought to share my cattrike 700 ride experience with you. forgive any presumption and self congratulatory rhubarb…..also the randomness of the narrative……. 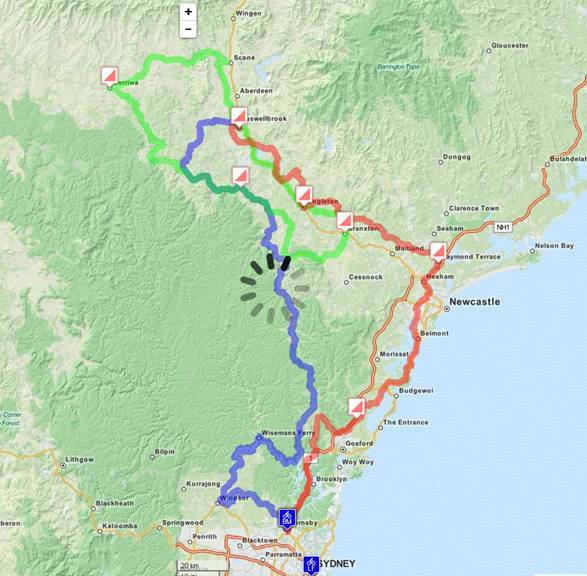 Well the hunter and beyond 1000klm audax ride is over…….whew. the hunter and beyond is a 1000 kilometer bicycle ride staged over an elapsed 75 hour time with timed control points along the way. It was run by audax Australia a long distance cycling club. But for me it was a trike ride to see if it were possible to meet the audax conditions on a trike and not on a road bike. The trike is 15kg stock rolling weight v’s my giant road bike at 7kg. I technically finished last but was within time cut off so joined the winners as a finisher . audax rides are not races but are tests of oneself over distance against a clock. The Challenge: ride 1000klm climbing 12000m on a set checked course within 75 hours elapsed time. Start Saturday 13th 6am Waitara .Sydney Australia. Finish by 9am tues 16th Waitara Sydney Australia. Breakfast and dinner plus an evening food stop provided. Everything else clothes food spares etc etc is up to the rider to provide and carry. So yes I did it with much support . yippeeeeeee. It was very hard with sleep deprivation playing its part. The most salutary aspect with this adventure was the kindness and support I had from my friends. I had some sense of representing for Newcastle and my friends as I was the only novacastrian fool- ish enough to participate. Without this support and kindness there is no way known I could have completed or started for that matter. It was as a direct result of the support I received sometimes in the wee small hours that I was able to complete. That 4.30am text message was crucial. 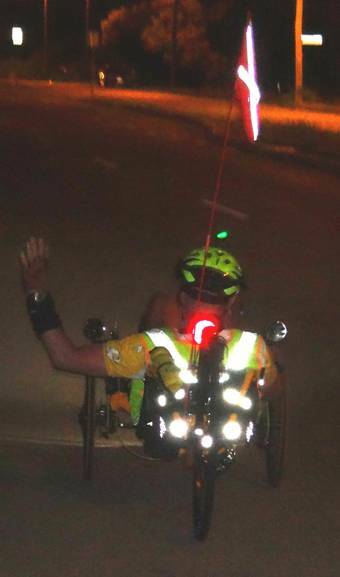 Having half the field of audax members whom had completed waiting for the last guy (me) to turn up with the lantern rouge was very very touching. I took from midnight at wyong to ride the last 80 kilometers to Sydney arriving at 7am at the finish line two hours before the cut-off. I was delayed by some light rain at wyong with subsequent two flat tyres and then poor puncture repair efforts and there was an emotive sleep deprived befuddled confused fool ranting in the bushes……oh wait that was me…. This led again to my mapping second error and some confusion with my err…..route oops. Oh well more riding…..
My fellow audax mad guys stood outside applauding as one as I somewhat sheepishly approached the finish line at 7am two hours before the time of 75 hours elapsed time cut off. Their genuine enthusiasm for my triking success was one of life’s beautiful moments and was truly quite touching as it was sincere. The guys applauding me were just finished some three to four hours earlier and were outside in the cold to . They are champions each and everyone and to be recognised by them is so deeply humbling. They have unbridled humanity simple as that. Probably a little too heavy for this particular hilly course and conditions but ideal for flatish county. The catrike 700 handled like a dream and was very comfy. I have none of the usual complaints of being on a bike for an extended period. And I was given respect by the motorists….. and I got to see the ride in my heads up position and not just the tarmac. So a thousand kilometres on a catrike 700. Woo hoo yippeeeeeee. Egads my knees egads my feet egads my……well everything else is okay. 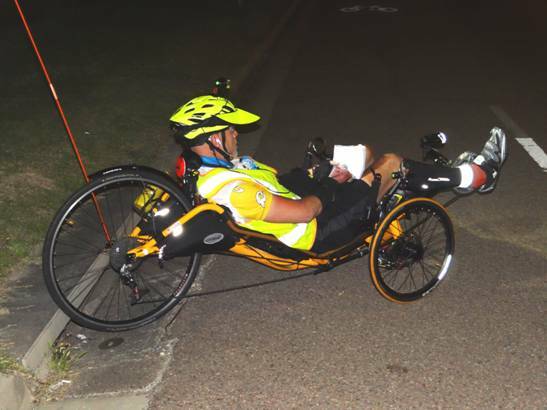 My friend and colleague took these photos on Monday night as I headed through Newcastle to Belmont and wyong. I was on a fruitless impossible mission to catch a group of four riders in front of me . But then at wyong it started to rain and I made a logistics error so gave up my quest. Would I do it again……………on a trike……………and not a bike…………of course! What’s not to like? 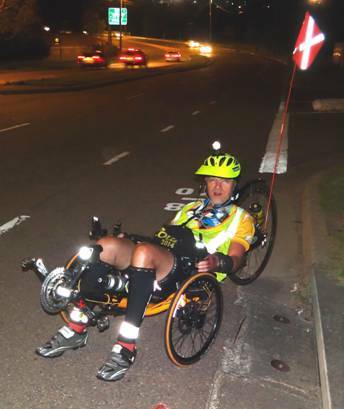 Trikes: I surprised a few of those doubting bicycle audax riders. Thanks for reading.